All the fighters slated to participate in tomorrow night’s “Strikeforce: Rockhold vs. Jardine” event tipped the scales Friday at the HRH Lounge inside the Hard Rock Hotel & Casino in Las Vegas, Nevada. 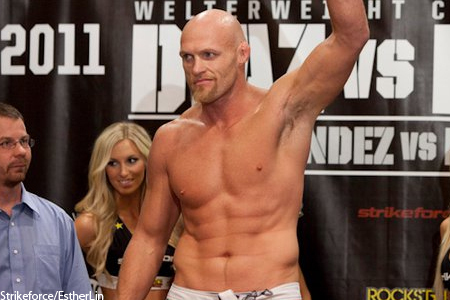 Veteran Keith Jardine (Pictured) challenges middleweight champion Luke Rockhold for his crown in Saturday night’s main event. A middleweight shootout between Robbie Lawler and Adlan Amagov serves as the card’s co-featured contest. The Joint at Hard Rock Hotel hosts tomorrow’s festivities. Showtime Extreme airs the preliminary bouts at 8PM ET/PT and Showtime will broadcast the main card at 10PM ET/PT.